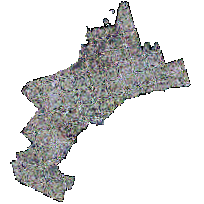 The Greater Toronto Area Orthophotography (2005) data set consists of 20 cm true colour digital orthophotography, collected in the spring of 2005 by First Base Solutions. The aerial photography was collected during April, 2005. This imagery provides high-resolution, true colour aerial coverage for the Greater Toronto Area. This data serves as a valuable information resource, providing a spatial context to features existing on the landscape in 2005. The digital imagery tiles are provided in GeoTIFF and MrSID formats while the municipal mosaics are provided as MrSID files. Both GeoTIFF and MrSID images can be accessed through image software that support these formats. Alternatively, Geographic Information Systems can be used to view the imagery within a spatial context.